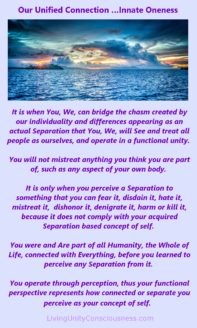 It is when You, We, can bridge the chasm created by our individuality and differences appearing as an actual Separation that You, We, will See and treat all people as ourselves, and operate in a functional unity. You will not mistreat anything you think you are part of, such as any aspect of your own body. It is only when you perceive a Separation to something that you can fear it, disdain it, hate it, mistreat it, dishonor it, denigrate it, harm or kill it, because it does not comply with your acquired Separation based concept of self. 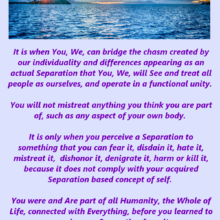 You were and Are part of all Humanity, the Whole of Life, connected with Everything, before you learned to perceive any Separation from it. You operate through perception, thus your functional perspective represents how connected or separate you perceive as your concept of self. …You can alter your Foundational Perceptions about Life and Self. Operating as One, connected and unified we thrive, in separation we don’t!